Syed Sarwar Abbas s/o Manzar Abbas (shaheed) embraced martyrdom when terrorist opened fire on him. The incident occurred in Orangi Town. On 27th May 2013 his brother also embraced martyrdom. 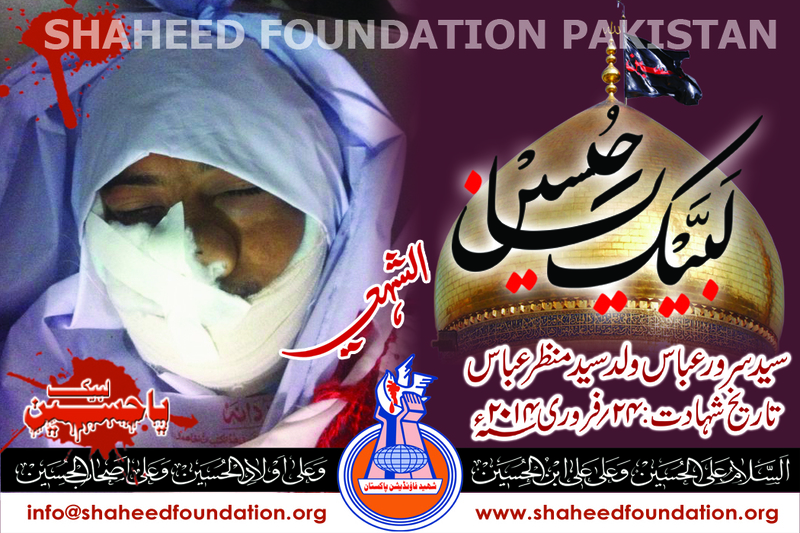 Namaz-e-Janaza of Shaheed Sarwar Abbas will be offered at 5:00 pm in Masjid-e-Khair-ul-Amal Incholi, while tadfeen will be in Wadi-e-Hussain. Zulm ke Khanjar ko Baree Hairat Hai! Kat Gaye sab ke galay ,aur Mara Koi Nahi!